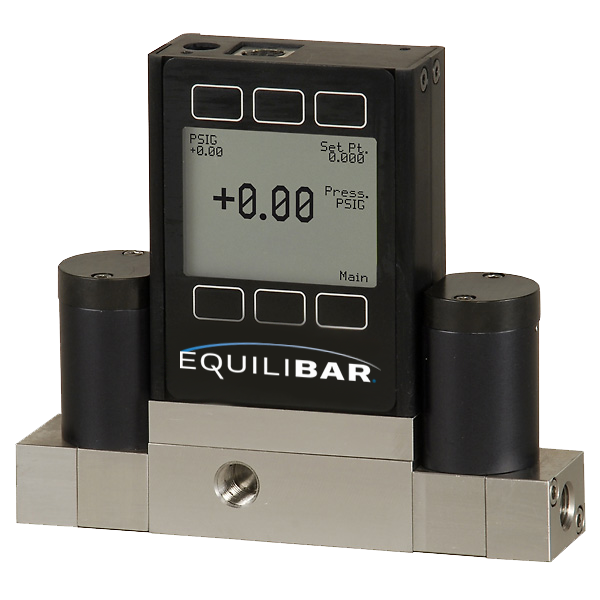 The Equilibar EPR 30Hg is a precision electronically controlled vacuum regulator. The EPR controls vacuum accurately and with high resolution within a closed volume or in a system with low flow rates. The EPR dual valve technology precisely controls vacuum pressure from 0 – 30 inHg. The EPR Series may be controlled with an analog or a digital command signal, or directly set by manually entering commands through the front LCD touch panel. Watch the video below to see how the EPR 3000 regulator works. The EPR 30Hg will work in a similar way by providing control from 0 to 30 inHg vacuum pressure. Two valve pressure controllers include a “fill” and “vent” valve. Outlet pressure is sensed and controlled through a type of PID loop. While many industrial pressure controllers utilize binary fill and vent valves, or analog fill valves with binary vent valves, the EPR-150 uses two analog valves for highly precise and resolute control throughout the entire range.